(so if somethings a little crooked - blame him => ) and worked hard to see this project through to the end. There are several people I have to thank who all helped make this process go just a little bit easier and to kept me from tearing my hair out: Babe - I have never loved him so much as I did last night while he was diligently placing labels on envelopes and stuffing them ever so gently w/ the completed invitation. His patience has been immeasurable. He's also told me we were never doing this again either. "oh what a beeeyouuuutiful morrrrrning oh what a beeeeyouuuutiful day I've got a wonderful feeeeeeling, everything's going my way......"
Yesterday I turned a corner in the wedding planning/crazy person process. 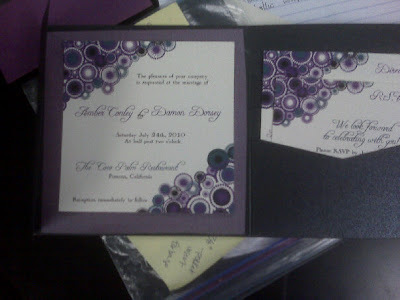 I went and picked up my invitations. I.AM. SO. EXCITED. like, for real - jump up and down squealing kind of excited. and I did exactly that upon arriving at my Dad's and seeing how fabulous they turned out!! I mentioned herethe lovely Melissa Munding designed them based on the 'examples' I had and they came out even better than expected and EXACTLY how I imagined them!! on today's episode of wedding Wednesday we have_ the initial fitting! whoo hoo!! So last night me and one of my bridesmaids and another friend cruised out to DB for my first dress fitting! As you may remember from this and this I have been working my tush off to get/stay in shape for this wedding and it has paid off!! Yesterday was one of those rare times when I was off in the middle of the week. and fortunately for me it happened to be a nice day out as well. (minus these prairie like winds - what the heck????) I had an appointment at the DMV early in morning and a bunch of other pertinent matters to attend to - not to mention I have been both physically & emotionally maxed out the last few weeks and truly needed the reprieve. Especially since our weekends have been so packed as of late. After my errands I stopped by my neighbor friend Niki's house and ended up running a few errands with her! LOL! I had to share with her about the new Cynthia Vincent for Target shoe collection check it out here SO CUTE! And we even managed to pick out some super CAHUUTE shoes for her as well!! To top it off my ADORABLE co-worker and friend went into labor in the wee hours of the morning and by late evening had delivered an 8lb baby girl!! !